Yes, I’m back in control of my territory again. My crevice will continue to be a safe home and give me good protection during the storms that are due soon. Winter is definitely on its way with the water temperature dropping down to 14C (it was 16C at its warmest) and the days getting shorter. Hmm, take a look at the photo, there is a topknot on the rock above my head that’s been hanging around since the summer. I’m never quite sure of its intentions, as you can see I’m wary and keep out of its way. Hopefully, it will move into deeper water for the winter, like many fish, while I stick around here on my home reef. 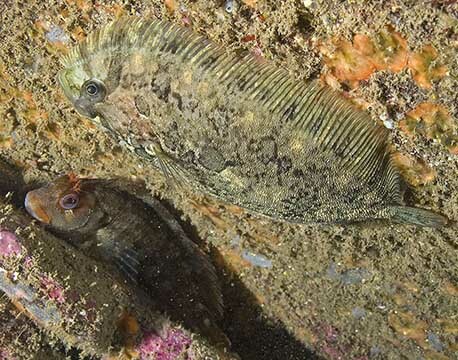 A topknot is a flatfish that is adapted to live on rocks, it spends the most of its time upside down and holds on to the rock using specially formed fins. I always think topknots are a bit mysterious but the very young tompot blennies have much more to fear because they are just the right size for a topknot ‘snack’. If a big one tried to attack me, I’d stick my fins out and make myself too large and prickly to eat! Author Benny the blennyPosted on 26th October 2015 2nd July 2016 Categories Animal behaviour, combtooth blenny, fish, Tompot blenny, Underwater photographyTags biodiversity, marine week, nature, sea, shallow water, territory, tompot blenny, Topknot, UK, underwater, Wembury, wildlifeLeave a comment on Who’s this hanging around?